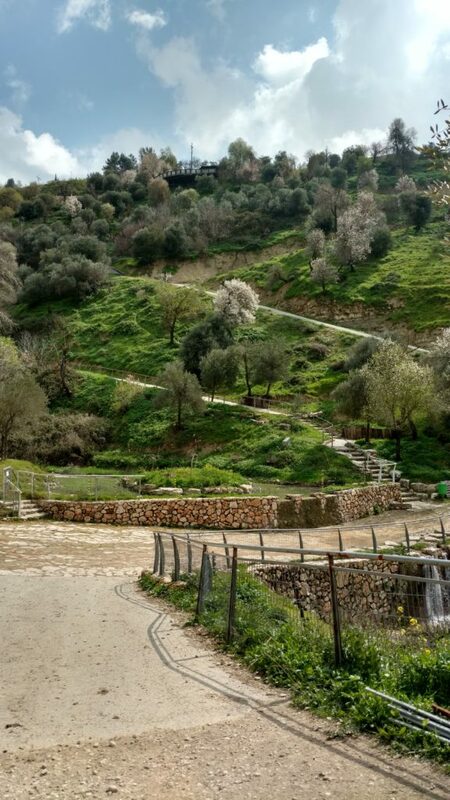 The town of Tzfat together with the Jewish National Fund recently rehabbed a park that had languished in disrepair, closed to the public for several years. Each organization had argued that the other was responsible to do the work and so nothing got done. In the midst of the wrangling a developer put in a bid to turn the park into a large, densely settled apartment complex, and a citizens’ group rallied opposition to the plan. Finally our new mayor stepped up, got an infusion of money from the government and got everyone to work together to renovate the park, and it’s beautiful. 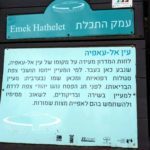 It’s called Emek HaTekhelet — Tekhelet Ravine. Tekhelet is the color of the special strand of blue that is wrapped around the white strands of Tzitzit, and it was a royal color used prominently in the textiles of the Mishkan. It’s also the sky-blue with which many of the walls and homes of Tzfat are painted, so it’s the official town color. 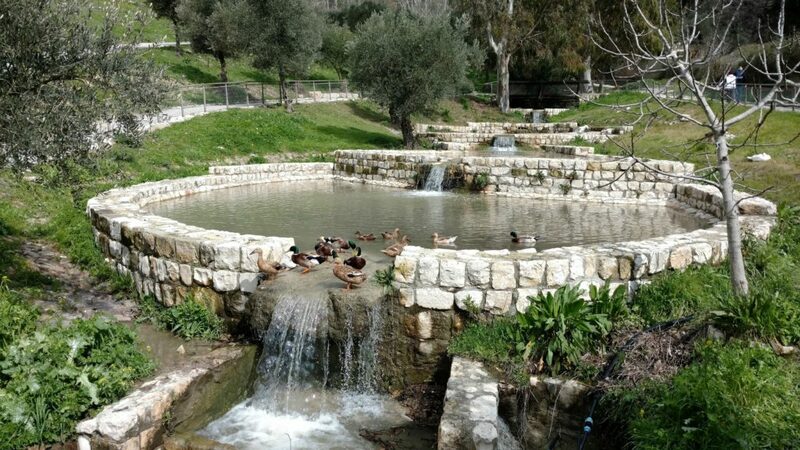 The park is at the northern entrance to town, surrounding a steep ravine with a mountain stream that runs from top to bottom, gathering in ponds and pools and waterfalls, with ducks and geese and a variety of deer. We visited the park the other day with good friends from Jerusalem and Sharon, Massachusetts, wandering along the switchback paths, appreciating the flora and fauna and the work that went into the reconstruction. And every person whose heart inspired them and everyone whose spirit prompted them came and brought the donation for HaShem for the work of the tent of meeting and for all its labor and for the holy garments. There’s a big distance between thought and action, between good will and its materialization. Many good intentions evaporate before they come to actualization. Many people carry within them exalted ideas and desires of the heart that never arrive at action. Therefore the Torah tells us that regarding the donations to the Mishkan there was not one person like that. “Every person whose heart inspired them and… whose spirit prompted them,” who had a will to donate, did not just leave it as will, rather, they all “brought the donation for HaShem,” they fulfilled their will and brought forth their thought from potential to actual. Rabbi Azulai draws attention to the difficulty of transforming thought to action. The material and social worlds have their own capacities and limitations, their own pacing, that can both comply with and resist the guidance of ideas. So we need to understand and navigate the structures and rhythms of the world, and apply our will persistently to be able to bring ideas to fruition. The construction of the Mishkan is an example of a successful process of transforming thought to deed. When lofty ideals, that exist in an indeterminate state, in the root of the soul and its aspirations, become confined within a particular boundary and enclosure, they immediately darken and descend from their hidden power. They gain a practical advantage and a handhold for action through their limitation, but they lose the higher purity they had before their materialization within their specific limits… Then [the ideals] remain with this mission: after they have become actualized and have become things that can be grasped by the practical world, they must be brought back to that level of height and purity and to that quantitative and qualitative expansiveness which they had while they were in the realm of the ideal forms. Rav Kook’s point is that in the process of bringing an ideal from the mind into the material world, there’s a compromise: the ideal becomes real, but it also becomes limited and less radiantly pure and inspirational. So the first attempt at actualization is not the end of the process. We need to keep assessing the shortcomings of what we have brought into actuality in comparison with our ideals, and keep making adjustments back and forth to help the real match the ideal more and more closely, and help the ideal shape the real more and more effectively. (“The Soul of Nationhood and its Body,” Orot,132-35). The re-establishment of the nation of Israel in our Land is a complicated process. Our ideals, expressed in our Torah and our rabbinic tradition, are exalted, but our realities are difficult. We are a passionate people with, yes, all kinds of inclinations, from the most spiritually and ethically refined to the more coarse, bless us all. Our homeland happens to be in the most contentious neighborhood on the planet, and our connection to our homeland is being challenged by stubborn and violent enemies and their hypocritical supporters. We have had to reinvent government for ourselves, and governing is a messy business. Our nation has, and needs, the full range of human character. Everyone contributes in their way. What we have accomplished in a relatively short time is impressive, but we are very much a work in progress. Our city park is not so grand a communal project as the Mishkan — though it’s named after the Mishkan’s sky-blue hue. But when a newly-elected mayor is able to get wrangling organizations and stakeholders to put aside differences and work together to rebuild something beautiful – hey, we can celebrate with a modest and enjoyable victory lap around the park. 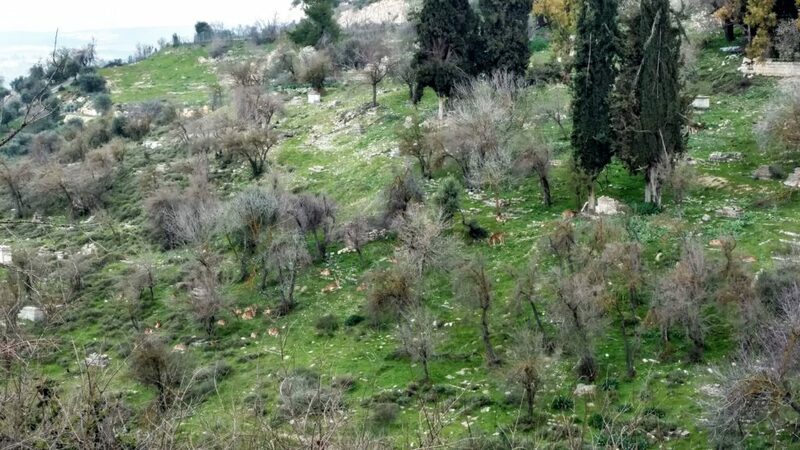 “The wetness of the slope indicates the place of Ein Al-Afiyah, that originated here in the past. 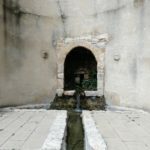 Residents of Tzfat considered that the spring waters held medicinal properties, thus its name (In Arabic: Spring of Health). Yes, the English signage is the next upgrade necessary in town.